It was invented for people like me, who spend way more than a dollar when they go in there. I can easily spend 25 dollars per trip at this store when all I walked in there for was rubber bands and Tootsie Rolls. 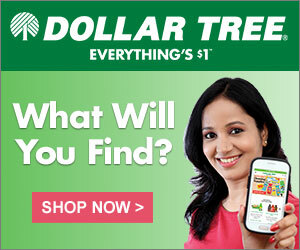 But there are items in Dollar Tree that are not necessarily worth your precious dollar. Here are some items that I think you need to avoid and some you should definitely add to your list the next time you pop into your local Dollar Tree. This is my opinion so please don’t email me telling me that you think I am a bad person because I don’t like the toxic plastic dollies. Maybe you like the dollies and to that, I say, good for you. ROCK ON WITH YOUR PLASTIC DOLLIES. When you use these, they leave wax shavings all over the paper and they break very easily. With kids who color hard and are not easy on anything in the house, these last maybe a day or two. Spend the extra fifty cents and buy name brand. I am gonna get preachy. So they stop making these. For four dollars more you can get a real Barbie doll at Target. The legs fall off, the heads fall off and they are not even worth the dollar you spent on it. Back away slowly from the crappy dollies. Oh, and by the way, it doesn’t have a smell when you light it because, I think, it isn’t even a candle. Those candles on the bottom shelf are fine though because they are faux candles. They don’t have a smell. Just like the “candles” above them. I don’t know about you but the stuff you buy at discount stores takes a beating so I can’t imagine these items lasting more than one use. Plus, nothing here is BPA free so stick with spending a little more. They are only babies for a little while. I love to save money but this is one I will spend a little more on. Plus there are always coupons for brand names on this stuff, so go to the big box stores for this. It is horrible for your carpets. Someone once told me that it sinks to the bottom of the carpet and doesn’t even get vacuumed up. And when they ripped up their carpet, there was an entire sub-floor full of this stuff. Plus it makes your carpet feel gritty. Burn a candle instead to get your house smelling nice. Sometimes food at Dollar Tree is a trap. You think you are getting a deal but you are not. Canned vegetables are A TRAP. Canned vegetables at the grocery are never, EVER more than a dollar. So you shouldn’t buy your canned veggies there. Unless they are under 2/$1.00. So pay close attention to prices. This should be a no-brainer but we learned the hard way, literally, with this one. Good toilet paper is worth the extra money. I don’t even want to know what this perfume smells like. If you are buying your readers at Dollar Tree, one could argue you don’t need to read in the first place. Because how is it that I have to pay $300 to see and you only have to pay one dollar? Explain that math to me. No, I am totally seriously serious. I love that store more than what is probably normal. So here is my must-have list for my favorite little dollar store. If you need to fill an Easter basket or a Christmas stocking? I have not bought a party plate, napkin or fork anywhere other than Dollar Tree in the past eight years-plus. It is my go-to place for parties. The colors are great for kids but the white is perfect for adult parties. I never go to the party store anymore because why would you when everything here is a dollar each? Tissue paper, ribbons, gift bags etc? It’s ripped up in a matter of seconds. Spend your money on the gift, not the wrapping. If your kids are like mine, this stuff is gone in a matter of days. And I hate spending a lot of money on this. Michael’s sells the box of foam stickers for eight bucks. This is the place to get all of your craft items and stock up for school projects. They also have great play school items for kids as well. Great for those would be teachers of yours or for you homeschooling parents out there. I homeschool every summer to avoid the summer slide, so Dollar Tree is amazing for me to give rewards and for keeping my daughter motivated. Sometimes Dollar Tree gets in brand name items. This is an example of a good deal because, at big box stores, items like these are upwards of $1.50. Dollar Tree takes coupons as well so this makes your dollar go even further, so keep your eyes out for these. I don’t recommend the eye makeup because eyes are sensitive and my daughter had a reaction to the eye makeup from here before but everyone is different. I recommend doing a test before you use the makeup on sensitive areas. They also carry brand name makeup at random Dollar Tree’s so check your local store. Blush, lip gloss, nail polish, emery boards, nail polish remover make great goody bag gifts for tweens! Check out my tween party idea below using Dollar Tree makeup items. It was a huge hit and so inexpensive too. But do be careful because sometimes you can find travel size items at Target for under a dollar. Candy is okay but again be careful on price. Just be aware of prices when shopping. The Mamba candy above is usually in the dollar spot at Target, so this is spot on. But some of the bags of candy are very small and you can sometimes find it cheaper at stores such as Walgreen’s so be a savvy shopper. We get it here when we needed it for preschool parties/snack; soccer snack etc.. But for regular bottled water, it is cheaper to buy it at the bigger stores for the amount/size you get. Because my daughters leave these everywhere but in their hair. In the couch, on the bus, in their backpacks. Why spend a lot of money on this? And it is a lot of money at Target and other bigger stores. I always buy this at Dollar Tree. One for the car, one at our sinks. It is cheaper here than at the bigger stores. Buy this here and skip the party store. If you use these once or break one, who really cares? But I have been known to reuse these a few times, so definitely worth the dollar. They are a steal at Dollar Tree. They have a pretty good selection and you pay half of what you would pay at the party store. When we run out of a ladle or needed an extra spoon for a church fundraiser, this was the place we went. If you need something in a pinch, this is the perfect place to run in. I can’t say how long something might last but sometimes it isn’t about the quality but just to have something in a time of need. I mean, two for a dollar? Granted some of them aren’t as say, fancy as the other name brand that will remain nameless but honestly it doesn’t bother me. I go here all the time for cards, especially for kids birthdays. Especially for kids who can’t read. They just throw them in the trash anyway. Oh, they do and you know it. Don’t get mad at me if you drop 50 bucks at the dollar store next weekend. And seriously, answer the reading glasses question for me. Head over HERE to check out all my fun Dollar Tree projects. I do love their gift wrapping stuff, gift bags, candy and serve wares! Best place to buy them. Hey there! Good to know stuff. I love DT too, but would NEVER buy kids toys (junk) either. I love that you can get mugs, glass beads, contact paper, dish towels, etc… But I always take a good look at it first before I buy. If for nothing else – DT is best for wrapping paper/gift bags – saves a TON over the years. Couldn't agree more. It looks like we avid/buy all the same stuff at the dollar store. Totally agree with you. Most of the stuff at DT is crap. I rarely go there – mainly just to pick up wrapping paper or cards. Great tips if I was willing to brave it! Thanks for the great tips! I am NOT a fan of the dollar store, it just feels creepy to me! I see all over pinterest and blogland people raving about their great DT purchases, so now at least I know what to look for and what to stay away from! Awesome tips! I've never really been in to the Dollar Store by my house, but now I totally have to go – armed with your list of course! The dolls there are crap. My 4 year old picked out some mermaids and when we took them out of the package they didn't have a full head of hair…completely BALD in the middle! Ugliest mermaids ever! DT is GREAT for a candy run, though! Great post! There are some things that are good to buy and others that are a complete waste of a dollar! Thanks for partying with us at Time To Sparkle! These are AWESOME tips!! Thank you so much for compiling this list together and sharing at Thursday's Temptation. Your post got the most views this last week so I am featuring it tonight at this weeks link party! Thanks for all the great feedback, friends! Tin foil is okay for us to purchase at DT. I buy it and it does the job. If u need it thicker just fold it in half. It is thin but for us it works for a buck. I am in more agreement with you for certain things. Grilling with foil I feel takes a stronger type of foil. The playdoh is just as good as the real stuff. And it's cheaper per ounce. Playdoh has 5 oz cans while the DT ones are 4 oz. Difference is, Playdoh makes their cans much bigger, but plenty of air inside. I was hesitant at first, but in a blind squeeze test, you can't tell the difference. The playdoh at my Walmart is only 2 bucks for a set of four so it is a better deal by me. But I am with you because my youngest leaves hers out so I am constantly replacing it. So DT is a better bet for me. Or I make it myself. I have a great homemade recipe if you are interested. I could spend days there too!! I an always looking for tips on other items and those I will add to my list! I have never purchased anything like that there, so thank you for the tip! I have purchased dinner plates there and they are good. I used to have it embedded in the post but it isn't up there now for some reason. Oh I can deal Heather. But when its all over my floors I'll call you because I have a feeling you can deal better than I can. I've bought their dinner plates before and they are great. Ooh lets go shopping then! ? I don't recommend the LA's Totally Awesome Oxy cleaning powder. I can't imagine what this stuff is. It looks like it was swept off the dirty floor of a laundry soap factory. Yikes! We DO use the Totally Awesome spray to get stains out of clothes and carpet. What I have bought a lot of and really like are their drinking glasses. They are very sturdy and have cute retro designs on them like colorful fruits or bright flowers! Reminds me of some 70's designs we had. Yes! I love their dishware! I totally agree with your assessments. I enjoy the dollar store but if your not cautious you can come out with 20 dollars worth of junk. Thanks for the heads up. A dollar is still a dollar, don’t throw it away on junk. About the glasses–they are READING glasses, meaning that they are put on when one’s eyesight needs a bit of help to read. If one is far-sighted, I don’t think these glasses would be of much help. But for a near-sighted person, such as me, when I wear my contacts to be able to see things at a distance, the close up things (reading!) are blurry. Believe me, the $1 glasses are SOOOOO worth it! I have a pair in every room so I don’t have to LOOK for my glasses (close up– I need glasses to see where they are! ?). For me, they are soooooo worth it. What about the frozen foods and kitchen items how do you feel about those items. I agree about most of what you say. So I don’t ever buy any of the frozen food items there. There are some brand names that I would think you could try? But they also sell frozen steak for a dollar. NOPE. I have tried the shelf stable items and they are fine. Thank you for visiting! I did buy winter gloves and a hat and they had a weird fumy smell coming off them. I don’t like the nail polish at my local Dollar Tree. I think it’s called L.A Color. Should be called Colorless as it’s practically invisible. I will spend an extra dollar or two for higher quality nail polish. The $2 stuff at Dollar General is pretty good. One of my favorite things from Dollar Tree is coffee mugs. My boyfriend has started collecting them for me because I love coffee so much. And he always gets me a little scarf to use as a ribbon for my hair.